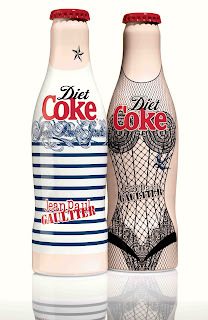 Diet Coke has just unveiled another of its fashion collaborations hot on the heels of its success with Karl Lagerfeld. Their latest partnership is with international designer, Jean Paul Gaultier, and the launch was typical Gaultier-Meets-Diet Coke highlighting both their style centric and light-hearted personalities. Taking place on the 5th Floor or Harvey Nichols, the bar area had been transformed into JPG land with enormous JPG diet coke bottles, breton striped t-shirted waiters plying decorated lace champagne cocktails, a paperself lash try-out area, manicurists and a glitter body art area as well as a tattooed dancer with a guest spot. Fashion journalist, Hilary Alexander, hosted the event and told short stories from her meetings with JPG as well as the many Gaultier shows she has seen in her illustrious career. 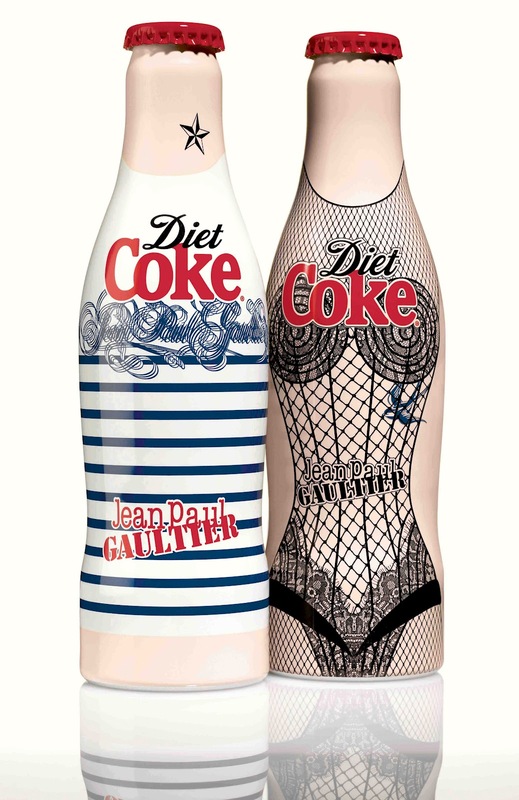 As part of his role as Diet Coke Creative Director* (*that was a new one on me, too), Jean Paul Gaultier is to work his magic on a number of creative projects, including designing a show-stopping limited-edition collection of bottles, creating a striking advertising campaign, and personally appearing in a series of humorous short films. Gaultier’s bottle designs have combined his unique signature style and his fun upbeat attitude to create the collector’s accessory of 2012. The collection themed ‘Night & Day’ pays homage to Gaultier’s trademark designs. The ‘Night’ bottle features a JPG typical corset style reminiscent of Gaultier’s catwalk shows and iconic cone bra design. The lace and fishnet design highlights the female-like silhouette of the iconic bottle shape whereas the ‘Day’ bottle is inspired by Jean Paul Gaultier’s signature Breton stripes. To complete the collection, a third limited-edition bottle, the ‘Tattoo’ design will be launched later in the year, inspired by Gaultier’s love of body art. The ‘Night & Day’ limited edition JPG bottles are available from Harvey Nichols stores nationwide from 16th April 2012 and are available individually or as part of a limited-edition collectors set. Previous post: Harvey Nichols’ Retro Style Window Frontage wows in Knightsbridge.